I don't know how this always happens... it's been over a month since my last post! The weather is gorgeous here in Wisconsin this week and I am finally feeling motivation to sit down and BLOG! We have been soooooo busy with reading and writing in first grade and I am excited to share a few of my new and simple ideas with you!! But first, a peek at what I bought in the big TpT Teachers are Heroes sale!!! Oh my gosh! I am so excited about all of these items!! Highly recommend them all!! I started putting together Miss DeCarbo's Intervention Binder for Language Arts! Many of these interventions will come in handy at the beginning of next school year. I have several students in intervention right now and there are some great activities that I am using now... especially for reading blends and digraphs. Ahhhh! I'm so in love with this resource. Alright, now for some more simple ideas that you can easily put together! After winter break, we made the switch from focusing primarily on short vowel word families to long vowels. My intervention kiddos have a hard time switching back and forth from long and short. This is such a simple activity that we did in my guided reading groups. I wrote simple CVC words on a piece of chart paper (some are nonsense words). Then, I taped a "magic e" to a bubble wand (you could use a popsicle stick). Students read the CVC word and then add a magic e to see how the word changes. We switch back and forth from short to long vowels. Then, I let the kiddos take over leading the activity. They LOVED it and it was great practice. These two cuties begged to use the poster to practice together during a round of Read to Someone... how could I resist?? This next activity, I thought up on my way to school one morning. I was looking for a way to spice up my phonics mini lessons during Daily 5. I got to school and taped together a few colorful boxes that I had from the Target dollar section. I wrote word families on post-its and stuck one in the bottom of each box. For the activity, I had my students create a wide aisle on the carpet, with students sitting facing the center. Each student had a whiteboard and a dry erase marker. I placed the word family boxes in the aisle and students took turns tossing a small pattern block into the boxes. After a student tossed the block, we wrote a word in the corresponding word family on our whiteboards. It was a great way to keep the kids engaged and writing our word family words!! We did this activity during two different mini lessons this week so that every student got a turn to toss the pattern block. Okay, I am still on an interactive notebook kick! My students absolutely love doing interactive notebook pages and they are perfect for our long vowel practice. This week, I had my kiddos sorting long i words by word family. First, I had my students read the words "down the columns." Then, for a fluency challenge, I had my students read "across the rows." It is more challenging and requires more quick thinking to switch between word families as they read the words! Here is a FREEBIE of my Long I Word Sort notebook page if you'd like to try it out! If you are interested in more long vowel interactive notebook pages, click this link or the photo of my product! At the beginning of the year, I identified several students (11 out of 20) who were reading below grade level for the beginning of first grade. Needless to say, that number was concerning to me because I only have eight hours a day with these kiddos! How was I going to help 11 students "catch up" to where they needed to be?? I started sending home weekly interventions with these kiddos and their parents have been pretty good about doing some extra reading and phonics practice at home. I am happy to say that as we approached February, 5 out of those 11 intervention students are now "at grade level." I was doing my happy dance and so were their parents. However, it was a long process and a lot of work to get the kids there. I am lucky to have so much parent support. 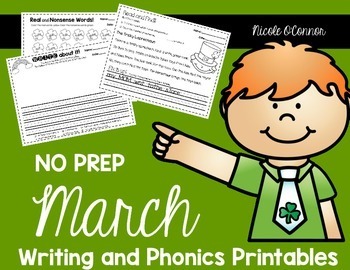 Therefore, I wanted to create some simple printables that the kids could take home weekly to work on their writing skills and some phonics (review) skills. I created these weekly activities that my students started taking home. They are earning stickers for each page that they complete, which they LOVE and they are LOVING the extra writing practice as well. There is enough variety in the pages that they don't get bored of them and the pages are simple enough that the parents can get them started and the students zip along! Here are some examples of the pages I created for March... this is my first week of printables, which I uploaded to TPT for free! Click this link for a free sample! I know,,, weird to start with the letter, v, but I plan to mix the earlier letters into months Sept-Feb when I start on those!! Had to do some backwards planning here!! There is also a full page of handwriting lines to print on the back of this half page. Getting in some fluency practice while identifying punctuation and counting the number of sentences. My students also LOVE "fixing my mistakes." If you like these free pages, please consider buying the whole set for March by clicking this link or the picture below! I have an April set of printables in the works right now and I plan to do a May set for sure! By the end of this coming summer, I hope to have sets for every month of the school year! Stay tuned! Okay, so that was a very random peek at some of my new literacy practices over the last few weeks! I always feel the need to spice things up to keep the kiddos motivated and engaged. I am also more excited to go to school when I know I have a fun new game or activity to introduce that day! I hope that you can use many of these fun, easy ideas! Enjoy! LOVE the fluency practice! Girlfran you've been busy!